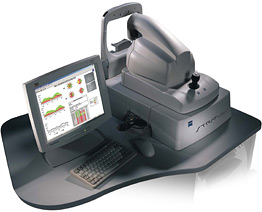 Ocular coherence tomography (OCT) is increasingly becoming part of optometry’s repertoire of diagnostic tests. More and more practitioners are purchasing or gaining access to these instruments. A desire to avoid overlooked subclinical problems, and the ability to explore and monitor suspicious presentations, drives the need for this high tech imaging. As OCT instruments improve, faster imaging and higher resolution provide better coverage and enhanced visualization of fine ocular pathologies. While the original focus of OCT was limited to layers and pathologies of the retina, the most current instruments also provide high resolution images and analysis of the cornea, anterior segment, and optic nerve head. OCT images sometimes present opportunities for treatment before problems become clinically significant. However, to take advantage of this sophisticated engineering, we must know the instrument’s capabilities and be able to interpret the data it produces. Following is a brief review of retinal layers and how they should appear on OCT scans. Knowing which retinal layer is damaged by pathology is an important part of determining the likely diagnosis. For example, how might a lamellar macular hole be differentiated from a full thickness hole? On OCT, lamellar holes show the layer of photoreceptors still attached to the RPE—while full thickness holes appear with a depression of the internal limiting membrane through to the outer segment of the photoreceptor layer. Sometimes it may be challenging to tell if a patient has a PED or CNVM—or both. On OCT, subretinal fluid or a break in Bruch's membrane points to a choroidal neovascular membrane. Sometimes fluorescein angiography is needed to make a definitive diagnosis, but knowing the retinal layer of involvement is crucial. Screening for early or forme fruste keratoconus by detecting focal thinning is critical with potential refractive surgery patients. If there is thinning of the inferior cornea, we proceed with great caution. Patients interested in LASIK enhancements also need to have sufficient corneal thickness for retreatment. To reduce the risk of ectasia, our standard is to maintain at least a 250 micron stromal bed. The anterior chamber angle can be imaged with the newest OCTs, which is useful for patients at risk for angle closure. Baseline images can help determine if patients’ conditions are worsening over time. While gonioscopy remains the standard, objective measurements with OCT provide visual supportive information. OCT is currently perceived as the hot, must-have instrument. But, while scans can provide great information, we encourage you to keep this technology in perspective. By itself, OCT cannot diagnose glaucoma or any other condition. It does not substitute for a thorough history, comprehensive exam, and above all, clinical judgment. We have carefully compared OCT models and none are perfect. Some of our offices, but not all, are equipped with OCT instruments—and we will continue to purchase more as the systems improve. Where available, we are happy to provide OCT scans and other diagnostic services at your request. Our doctors can provide interpretation or we can forward the images for your analysis. Diagnostic service referral forms outlining specific services at participating PCLI offices are available in the "For Doctors" section of our website at www.od.pcli.com.